Seriously my friends, is there anything better than chocolate and toffee together? 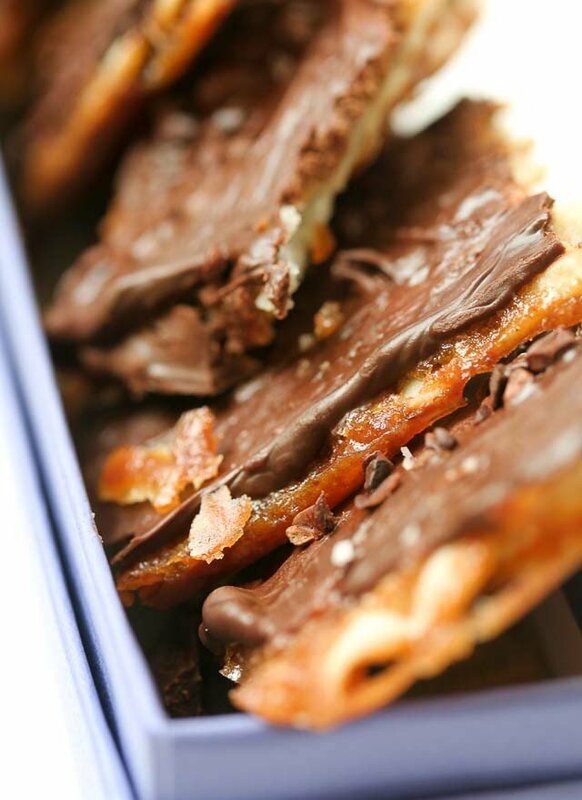 Especially when the toffee has a brown sugar-flavored buttery snap and luscious chocolate is smeared over the top so it hardens and melds with the crackly caramelized matzoh underneath. When a marriage is this good, a picture can only do partial justice to the love that exists between the happy couple. The Caramelized Matzoh Crunch, adapted from the original recipe by Marcy Goldman, I added a good pinch of salt to the original recipe, as well as a soupçon of vanilla too. And there’s no law (yet…) that says instead of pressing some crushed toasted nuts on the warm chocolate, go minimalist and simple sprinkle a few grains of flaky sea salt and roasted cocoa nibs over the top. Lastly, don’t be tempted to get all fancy and eschew the standard chocolate chips and chop up some top-notch chocolate for the coating. Since chocolate chips are designed to hold their shape and harden firmly after they’re melted, here you should use regular chocolate chips, the kind you buy in the supermarket, for spreading on top. This recipe is adapted from Marcy Goldman of Betterbaking.com, whose latest book is A Passion For Baking. It’s super-simple and requires no fancy thermometer, equipment, or ingredients. If you can’t get matzoh, use plain crackers such as saltines instead and omit the additional salt in the recipe.For passover or vegans, Marcy advises that it works well with margarine. And for our gluten-free friends, this would be superb made with any gluten-free cracker. I’d love to hear about any variations you might try with it. 3. In a 3-4 quart (3-4l) heavy duty saucepan, melt the butter and brown sugar together, and cook over medium heat, stirring, until the butter is melted and the mixture is beginning to boil. Boil for 3 minutes, stirring constantly. Remove from heat, add the salt and vanilla, and pour over matzoh. Working quickly, spread the caramel with a heatproof spatula. 4. Put the pan in the oven and reduce the heat to 350ºF (175ºC) degrees. Bake for 15 minutes. As it bakes, it will bubble up but make sure it’s not burning every once in a while. If it is in spots, remove from oven and reduce the heat to 325F (160C), then replace the pan. Note: If making for Passover, omit the vanilla extract or use a kosher brand. Man, thats the kind of picture you want to see first thing in the morning. Yum! Id love to sink my teeth into that with a large cup of coffee. Wow, that’s a pretty yummy looking breakfast idea! This recipe is looks pretty idiot proof and no thermometers in your saucepan. What valid excuse is there not to try this? brian: I don’t know…I couldn’t think of any excuse either! I have the recipe for your original version and have made it. It was a good way to use up matzoh after passover, even though I can buy it year round. I think that when I made your original recipe I sprinkled some of it with dried cranberries, as appropriate at step #6. When I saw the beginning of this post in my news reader I thought you were repeating posts and was going to make reference to the Hollywood writer’s strike. Then I read the entire thing here at the website. Thanks for resurrecting that recipe, which looks delicious. Can I find matzoh here, like at Carrefour or Intermarche I haven’t looked so far, but I don’t seem to remember seeing it. Hey, do you have any suggestions for the person who, like me, finds herself with a bowlful of leftover Pierre Herme Lemon Cream in the fridge? Besides a tart, I mean. In its original incarnation it made a little tiramisu-dealie with biscuits rose de Reims, but there’s a lot left. Being that it’s incredibly delicious, I’d like to make really good use of it, and you’re the likeliest source of inspiration I know. Oooh…sounds like cracker toffee! Though we used to use graham crackers in place of the crackers. I grabbed this recipe the first time you posted it, and make it all the time, to wild acclaim. Now I’ve got something to do with the cocoa nibs that have been floating around in the back of my cupboard for a bit, waiting for a recipe. Any way to disguise matzo with chocolate and caramel is always a hit at our seders. Who know you could use the words “matzo” and “yummy” together? Uh oh. I know where this is going now. I think I just found a new use for the home made crackers. And here I was congratulating myself for using my machine to create savory treats. It never lasts. If you are unable to find matza, you can also use saltines (unsalted or regular, just reduce the salt in the recipe). I make it that way all the time, but i will definitely try it with matza during passover. I just absolutely refuse to eat matza any other time of year. Am I the only one around who loves matzoh? Andrea: LOL. I should re-write the post…or go on strike too. Hilary: Vanilla is a pod from an orchid so I think the beans may be kosher, but once steeped in alcohol, any grain in the liquor might be the culprit. But I’m not sure either. There is kosher vanilla out there, but it can easily be omitted too. Risa: Use those nibs~Brownies, cookies, waffles, granola—I like them in everything. Note: Sometimes they look whitish if they haven’t been used in a while. That’s often the fat rising to the surface and isn’t a problem. So don’t chuck ’em, like some people do, unless they’re really old. i made this a few years ago, using real butter, for a non kosher passover seder, and it was so easy and delicious i couldn’t believe it. We make this every christmas, only we use saltines and add chopped pecans as a topping. Wonderful! WOW! Thanks David! I’m making this for Wed. evening! 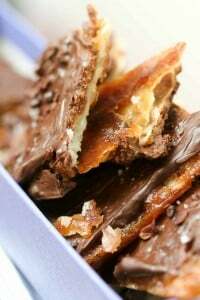 I’ve had many a regular toffee making failure, but this recipe looks pretty darn easy & potentially successful even for me! Yum, David, I’m so totally going to make this — thanks for the new revision! And yes, so my little dairy/egg/nut-allergic boy can have some, I’ll be using vegan margarine (“buttery sticks”) and will use toasted cocoa nibss. Man, it’s going to be great! And I’m with you, I like Matzo too. Toast it (watch carefully, it burns quickly), spread with high quality butter and sprinkle with sea salt. Yum. David – no, you are not the only person around here who loves matzoh. Regardless of whether it’s covered in chocolate and toffee. I love matzoh too! But then, is that surprising, coming from the person who cheers at every mention of prunes? oh, this looks fantastic. how well does this keep? i am thinking about using them as a party favour this coming weekend. I was some right now!!! I used to love matzoh with mayonnaise when I was in college…sometimes all I could afford. For Risa, ever try putting a measure of those cocoa nibs in the filter basket of your coffee pot, with the coffee? YUM! I thought I hit the wrong button, wondering why I had ended up at an old post that has kept me reading your blog since. The first recipe was a revelation, truly addictive, I can’t imagine what will happen with the new and improved version. Holy crap. I think that might be the best idea I’ve heard in ages. Roasting some up now to throw in tomorrow morning’s coffee. great photo, great recipe…and no, there is nothing better than chocolate and toffee. I absolutely love this recipe, thanks for bringing it to my attention. 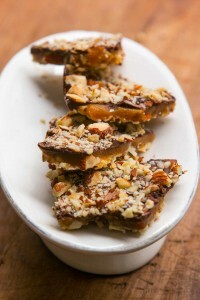 I will be making it for some toffee loving friends very soon…and I won’t forget to set aside a small stash for myself! Pose in the suit for posterity, then list it on CraigsList as Vintage, collectible, museum-quality, limited edition (for that kind of money, you saved the label with the serial number, didn’t you? )….going for about 15K–in Euros, with a very very slight dollar discount. You watch–with the writer’s strike on, and the Oscars hung up, someone from Houston will figure they’ve got a chance and email to ask if it goes with boots. If you’re serving the matzah crunch at a seder, bring it only at the end, or no one will eat anything else and your aunt will be insulted. Warn people not to make a Hillel sandwich with it so you won’t be insulted. The apple haroset might go ok, but the horseradish? Feh! I’ve been trying to get this recipe right for years, but for some reason, my caramel layer always feels a bit gritty in the mouth and usually has a burnt molasses flavor, too. I’ve given up on the oven method and substitute a traditional english toffee instead (it uses corn syrup and water and has a smoother snap), but I would prefer to be able to make it this way — I find that sticking the whole shebang in the oven allows the matzoh to absorb the butter, which tastes more decadent. Any extra tips or details on how to successfully make the crunchy caramel part would be so appreciated! Like, for example, after 3 minutes of boiling, should the butter-sugar mixture still look sugary/grainy when I pour it out? Hilary: Here’s hoping Louisa will chime back in, but here’s a pretty interesting description about the difference between kosher versus kosher for Passover. Charlene: The brown sugar should dissolve after all that heavy-duty boiling. Try using a ‘real’ brown cane sugar like C&H (I think Domino on the east coast is the equivalent.) You can also find muscovado sugar are specialty-food stores too. To test your brown sugar, rub it between your fingers: if the brown coating rolls off, it’s likely beet sugar sprayed with a syrupy coating and that may be your problem. I think these would disappeared in no time at my home. Looks yummy! There are many reasons I adore you, but turning Matzohs into something other than a bland cracker has got to be in my top ten. Shalom right back at ya (and kiss, kiss too). No matter what else I serve, this is everyone’s favorite at the Seder. It’s impossible to make too much. DebbieN, please, what is a Hillel sandwich? Shalom to you too David, indeed Shalom to all of of you. As for the gut yontiff (or git yontaf, dixit my grandma), I’ll wish it back to you in about three months, before the seder. I’ll even try this recipe, despite my skepticism about anything done with matzos, except matzobrei. No more war, more Shalom. Actually I have a question about that. It was my first time making toffee, so not sure if I did something wrong. Before the mixture got to 300 degrees like the recipe calls for–actually I think it was at about 240, it started to smell burnt, and was smoking a bit. I pulled it off the heat and decided it was done. It turned out perfectly, so I’m wondering if my candy thermometer is off? It’s a new one. Is there any way to calibrate it?? Wow, I am astonished. I can’t believe people eat matzo by choice. Unless it’s Passover, you won’t find that stuff in my house. (David, my apologies)…Simona, a “Hillel sandwich” is just what we call it in English–it’s the part of the seder where after you say the bracha over the maror (bitter herbs) there’s a description, at least in Ashkenazi haggadot, of a sandwich Rabbi Hillel supposedly made with matzah and maror–somehow that’s evolved to make a matzah sandwich with apple haroset and horseradish to mix the bitter with the sweet. It’s kind of a later historical tradition added in to keep things interesting while you’re waiting for the next cup of wine. Haroset and horseradish is a combination not found in nature, I fervently hope, and I’m not sure the matzah improves it, but I like it anyway–once a year, as Hilary says. Chocolate AND toffee! What a perfect recipe for someone named StickyGooeyCreamyChewy! I could eat this stuff all day! Dana: You can check the accuracy of your thermometer by putting it in a pot of water and bringing it to a boil: at sea level, it should read 212F. Make sure the bulb of the thermometer isn’t touching the bottom of the pan, which is usually hotter than the water. oh my, what a lovely variation on serving matzoh!! looks so luscious and decadent!! Not sure if we get matzoh here in NZ, but then I’ve never looked for it and besides I’m sure to find a ok substitute – and this looks far too good to pass up!! YUM! Man, those look sooooo good! My mom and my aunts are planning their Europe trip, they’ll be stopping over to Paris any suggestions what are the things they shouldn’t miss? David, I didn’t think the original recipe could get any better but this one is over the top Super Fabulous. Thank you. Excellent point on kosher versus kosher for Passover. I seem to recall that Passover potato vodka is allowed during the holiday; if so, it would be great to have a recipe for homemade pesahdikh vanilla extract. Another option might be to make vanilla brown sugar by putting the brown sugar in an airtight container for a couple days first along with the seeds of a vanilla bean. My usual preferred festive Passover dessert is mocha-cinnamon merengues crumbled over homemade cinnamon ice cream or Dr. Brown’s pesahdikh root beer with homemade vanilla ice cream in it for the float! However, I will add the matzoh crunch to the list . . . it would make a perfect hostess gift when we go to seder out of the house. As someone who craves tasty food during Passover, a post on pesahdikh sweets would be very welcome in mid-March or so . . .
Ms. B, or you could just use imitation vanilla (I know, I know, but it’s for Passover). You should check out the post I recently did; 10 Insanely Delicious Things You Shouldn’t Miss in Paris. Also over in the Categories, in the upper left box, there’s tons of other Paris tips as well. For Bron: I’ve found Matzoh on sale in my local supermarket (a New World in Wellington, NZ) usually at the time leading up to and the time of Passover. I made this last night with my daughter….so good! Here’s the picture of our batch. Thank you Hillary. I am always very interested in the various traditions. I’ll look in our Haggada this year, I wasn’t even aware that there are serious differences between the Ashkenazy and Sephardic ones ( I know there are differences in the songs/music). But we do eat matzo with Haroset, which my mother ( 88 YO and and very active) has to prepare in industrial batches as it’s so good and popular ( we only LOOK at the maror). As we really eat Matzo only at the SEDER ( we are not religious) , I’ll give a try to the cruchy ones, maybe my grandchildren will become more positive about Matzos ( they do expect however the Aficoman – ALL of them). No more war, more crunchy chocolate matzos! dana – you shouldn’t have any problem finding matza in iowa if you are in the Des Moines area. The majority of kosher chickens in the US are processed in Des Moines and the surrounding area by the big players in this market like Empire. Many of the people who work there are very observant Jews, and there is a sizable orthodox community there. I would think you would be able to find it in any major supermarket year round, not just before passover. Thanks for the info–I had no idea about the kosher chickens, etc. I’m near CR, not DM, but I’m pretty sure I’ve seen Matzoh in our store. If the weather clears up I’ll check it out tomorrow! 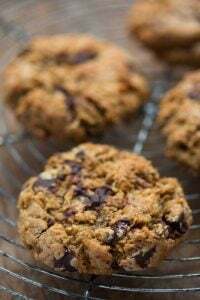 My cousin just sent me a text message: “MFK Fisher writes about melting dark choc w crushed saltines – fabulous!” (She is reading one of her books right now…ironically, I got that message while I was blogging about MFK’s ginger cookie recipe). Obviously, we love the salty cracker and chocolate combination. I’ll have to try your recipe the next time she visits. You had me salivating at “brown sugar-flavored buttery snap and luscious chocolate.” Luscious indeed. Okay, David. That’s IT. From now on when I eagerly read your blog I’m going to cover my eyes and just peep between my fingers. How CAN you post such enticing photos that make me want to go consume every bit of chocolate in the house? Seriously, though, reading your blog is the only thing that inspires me to want to cook. If I could make chocolate-covered matzoh like that, I’ll get back in la cuisine, and invite friends for tea. I love warm matzoh with honey comb …….but I am making yours! OMG. I am so making this and some vanilla bean ice cream for dessert on Saturday night! I just made a batch for myself and its MIGHTY TASTY. I made this for my family for new years for the first time and they LOVED it! I have to admit that when I first tried it at a friend’s house, I couldn’t stop eating. I used saltines instead of matzoh and add white chocolate chips to get that fancy swirly effect. Soo good! I can’t take credit for the name, but amongst my friends it is referred to as Matzo Crack…The stuff is addictive! Thanks for the fabulous recipe! I’ve made it twice now – the first time I used the metric weights given and (while delicious and still crunchy) the result was very greasy and the chocolate didn’t really set. The second time I used about 125g of butter instead, with spectacular results. Could there be a problem with the metric conversion? I used the tray size given but I could only fit about 3 matzohs in it in a single layer, so maybe that affected how much butter it could absorb? BTW, I can’t believe anyone could eat this for breakfast!! Hi Lara: Depending on where you live, butter is quite variable. For example, the butter in France is higher in fat than American butter, so I did make an adjustment based on that. 125g is about 4 oz, one stick, or 1/2 cup of butter. Glad you made the adjustment for what’s available where you live…and yes, I can eat this for breakfast! I’m in Australia, but I always use European-style butter for baking so that explains it! I often find I need to adjust the quantity of butter (i.e., halve it) when I use American recipes. I once made some brownies that ended up with a congealed layer of fat on the bottom – they were delicious, but all my friends thought I was trying to kill them! This recipe was fantastic! I whipped it up in a half hour, and my husband and I consumed them almost as quickly. I used saltines, chopped up chocolate (I’m having a hard time finding chocolate chips here in Brussels–ironic, this being the chocolate capital of the world). Oh, and a sprinkling of fleur de sel? Divine. Just discovered your blog last week and made this today. Not only is it easy to make, it is so much fun too (never made toffee before for some reason – great to watch and handle that gooey, sticky, bubbly mess). David, thanks for the great recipe! I made it with milk chocolate, my sweetheart’s fave. He loved it, so I’m going to make him his own batch, with almonds in the toffee and shredded coconut, for Valentine’s Day. I’m posting a link on my blog to your recipe. Merci bien! Evil! Evil! We’re on our 4th pan this week. I actually jones for the matzoh crack. We do 70% choc, toasted pecans and fleur de sel. 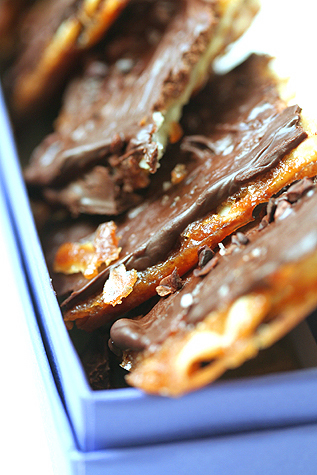 The perfume of the toffee wafts through the house for hours….matzoh crack. Aaaaaahhhhhhhhggggg…. This looks amazing, and is exactly what I want to bring to the seder. But I don’t have an oven or chocolate chips (thanks to living in Brazil…). How can I make this on the stovetop alone? Maybe you have another idea for something to bring to the seder? I am trying to impress that pants off my boyfriend’s mom, but something tells me I may fall a little short without my standard aids by my side (food processer, oven, peanut butter, chocolate chips…. argh). Any ideas? Sally: You can make this with the equivalent amount of bittersweet or semisweet chocolate, but since it needs to be baked, perhaps a neighbor will help you out if you share some with them. Can you recommend any good K for P places to dine during the holiday in Paris? David and Lara: I tried making this yesterday using only 125 g of butter, since I’m using French butter, and the toffee didn’t come out right — it was too grainy, and never melted properly in the oven. The candy is still delicious, of course, but what should I have done differently? Did I boil the caramel for too long? Should I have added water to the butter and sugar mixture? Wonderful recipe! I’ve made similar desserts using other ingredients but never with Matzoh, what a great idea. Thanks! Just made this- yum! I plan to bring it to work for my colleagues to enjoy. I think it’ll be a huge hit. Thanks for the recipe, David! What a nice change from the other Passover desserts that just scream……Passover! This was yummy enugh to eat any time of the year! I made this 2 night ago. I have to be honest and tell you it was a big mistake…LOL. Ony because I LOVE IT! Despite what you say in the recipe I used a good bar of 70% cocoa bittersweet chocolate that I broke up into “chip like” pieces. Oh my! I ate 4 pieces ignoring my conscious the entire time. I had to take about 1/3 of it into work because I was afraid I would eat the entire package. Great job on providing a recipe that does answer that call of my occassional sweet tooth! YUM! It’s in the oven right now and it’s bubbling and heaving like some candy horror movie. The Eleventh Plague: Caramel Demon Matzoh! Everyone loved this, but here is a worthwhile variation: use Tam tam crackers (unsalted). The toffee spreads under the pieces when you coat them so both sides are covered. You can easily break apart the hardened finished product between crackers without all the crumbs. I suppose you could also break up matzoh before you coat it. i’m not jewish but now i have another reason to visit the passover aisle in April. These came out buttery purrfection. Thanks for the recipe! It’s better than the Epicurious and Martha Stewart ones. I gave you a shout out on my blog. I made 3 different kinds – Chai Spices, Almonds, and Chipotle Pistachios. My favorite variation of this fantastic recipe is to sprinkle crushed red pepper flakes on it once you’ve spread the chocolate. Then you can call them Devil’s Food. NPR’s Ari Shapiro brought bags of this to share with the Morning Edition staff when he guest-hosted last Passover. VERY popular (both the Matzoh & Ari!) Needless to say, it disappeared very quickly! I would really like to make this but I can’t find brown sugar in Paris. Where do you get yours? I can only seem to find cassonade. Ashley: You can use sucre vergoise, which is available in many supermarkets, or sticky cassonade (as opposed to the dry, granulated). Check out my post: American Baking in Paris for more on French/American ingredient substitutions. Will you be angry with me? I’ve already made them with cream crackers (because matzohs are expensive ingredients), mascavo sugar (it`s cheap in Brazil and it is tasty) and margarine (I started cooking 10 p.m. so there was no open supermarket). The result? One of the most simple tasty delicious dessert I’ve ever made. Those should come with a warning label! I made them on a night before I was to have surgery and had to stop eating at midnight. They were cool enough to test at 11:30pm. It is just downright cruel that I can’t eat the whole pan tonight! Oh well, something to look forward to coming home to! I just made these with Wassa crackers. Fantastic! I made these last night with unsalted matzohs. I took them to a post-concert reception where they were immediately “scarfed up” – so crunchy and delicious! The recipe works beautifully. On half the completed batch I sprinkled chopped walnuts; on the other half,coarse sea salt. I just made this and one word comes to mind…WOW! and another…INCREDIBLE! it was so easy, took only half an hour. it came out so crunchy, and the buttery toffee, dark chocolate and in my case hazelnuts, what could be better? this is perfect for passover as well Im gonna make a couple of batches to give as gifts! thanks Dave! Hi, David! I’m planning on making this wonderful stuff for the first time on Friday night; I’ll be sharing it with relatives so that I’m not tempted to eat it all myself. I had planned to use unsweetened chocolate until I read your account of Nick Malgieri’s supernatural brownies. I made those last night to share today with co-workers, and hooooo boy, these are serious brownies. Recipes for mediocre brownies are a dime a dozen, but when I see one from Nick — and one that includes a half-pound of chocolate and serious amounts of butter and eggs — I know it’s going to be worth the time, energy, and resources. Now, about using unsweetened chocolate (plus sugar, of course) for recipes like this matzo: I was successful in using unsweetened chocolate in the supernatural brownies because I added an additional tablespoon of granulated sugar for each ounce of chocolate. That’s baking, though; the chocolate for the matzo is simply melted. Is it at all possible or advisable to, perhaps, melt unsweetened chocolate and whisk in sugar to use in this way? (I’m an experienced baker, but I have much more experience with baking with cocoa than with chocolate.) If it might work, what type of sugar would work best? I understand how important it is to use correct ingredients in baking, but there’s also the need to use what’s on hand, especially when one is moving two states away in three weeks. It’s nice to be able to clear out the pantry, hey? Bravo. I made this in a vegan version and topped it with cocoa nibs and flaky sea salt. My coworkers were clamoring for the recipe. My first batch burnt slightly — I missed the step of turning down the heat to 350 after preheating — and so I made a second batch with the oven at 325. That one came out perfect. Thanks to my friend Jules from Vancouver for sending me this link – and to you David for this recipe. I have been a fan of Matzoh since first introduced to it in 1978 and yes, toast it, eat with P & J, have it dry with tea, eat it with absolutely anything. I bought some of this choc-caramel crunch 2 weeks ago in Vancouver while on a visit and I am absolutely thrilled to get a recipe which sounds quick and easy, with a great blog which has kept me entertained. THANKS! Um, so, I’m schmearing my keyboard with not completely cooled chocolate from my first batch. WOW! Unbelievably, I-shouldn’t-be-home-alone-with-this-stuff, GOOD. I vegan-ized this using a soy based margarine. Haven’t made the butter version yet so don’t know what the “test kitchened” notable differences are but can attest to this recipe converting to vegan easily (and painlessly). Delicious. I made these for passover this past year and our host had to hide them in order for them to make it until dessert! Luckily I had extra in my freezer for us to enjoy at home over the next couple of weeks…not that they lasted that long! This is my 4th or 5th time making Matzoh Crunch….Started as just a way to use up my Leftover Matzoh from Passover but this has become a tradition in our family we now have it for every major holiday!! My mom has been making this recipe for years. It was passed down from a friend of a friend of a friend and has been scribbled and rescribbled on scraps of paper. She is the only person our family knows who makes it and people are always amazed when they hear the recipe. We always make it with saltines and chopped pecans. This past year though, she did a batch with white chocolate and sour dried cherries and cranberries. It was a huge crowd pleaser. I was thinking of ways to add the flavor of lime to it also. Zest maybe? I’ll have to see. Ok, your candy section looks out of control good. I am going to make this with gluten free matzo for my boys this Passover and they will have you to thank! I made these today substituting the matzoh with Rice Krispies. I halved the recipe for a first trial and used a smaller pan~ spread a layer of cereal in pan, pour toffee mixture over (basically the same precedure as with matzoh. It came out incredibly light and super crunchie!